After some rough starts, Joseph Kinney ended up doing quite well for himself in the steamboat business. He built a mansion for his family just across the Missouri River from Boonville. The mansion was playfully called Rivercene by Joseph and his wife Matilda as a pun playing off the fact that the river can be seen from the house and the house can be seen from the river. Rivercene still stands today and it remains a striking building unlike any other in the area. This artwork is for the Notable Missourian book on Joseph Kinney, written by Maryellen McVicker and published by Truman State University Press. This illustration for the Notable Missourian book on Joseph Kinney saw some changes since the most recent composition sketch. Mainly, I changed the angle of the steam ships so it looked more like they were passing by instead of heading right for the poor spectators. I also changed the POV of the ships to make it appear as though the crowd is on higher ground instead of near the shore line. Below is the final illustration along with some of the original composition sketches for this chapter. An early idea sketch for this chapter showing the race from inside the wheelhouse. I still like the potential of this one. An early rough sketch. Hell I'm not sure why I'm including this one. It doesn't look like a race or anything really. It more looks like some knucklehead just hanging out with his lady and waving a flag while ships pass by. The illustration of Joseph Kinney working in his Boonville shoe store unexpectedly turned out to be one of my favorites from this story. I just really like the atmosphere. Below is the final art along with the original composition sketch and the revised composition sketch. This artwork is for the Notable Missourian book on Joseph Kinney, written by Maryellen McVicker and published by Truman State University Press. This is another illustration that ran through a few versions. It depicts Joseph Kinney's venture into flatboat ownership ending in disaster. Flatboats were an affordable means of moving goods down river, especially before the steamboat was firmly established. Rivers were pretty treacherous to navigate due to snags and boat wrecks were not uncommon. When such wrecks would happen, nearby flatboats (should they be around) would help rescue the crew and save the cargo. 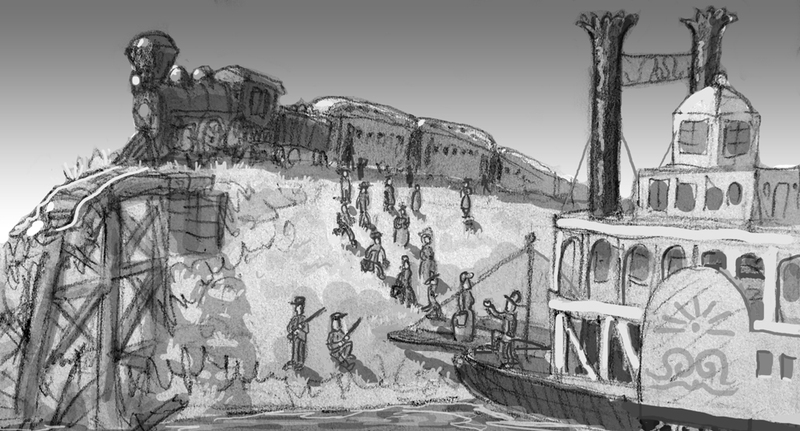 Originally I thought an illustration of such a scene would be interesting to look at, but the problem was that Joseph Kinney lost most all of his cargo which makes it unlikely that there would've been another flatboat close enough to salvage anything. So I pushed the other boat far into the background and made some other changes as well. Both versions are shown below. This is the final art showing Joseph Kinney's wrecked flatboat. Here is the first version of the flatboat wreck with another boat helping out. While I do like the commotion of this one, Joseph looks a bit too calm. Like he's asking the other captain how his corn crop is coming along or something. Here a young Joseph Kinney is seen working for his uncle and admiring an early steamboat passing by. And so began his life long passion for steam boats. This one went through a few changes in editing. It was decided that it was more likely that Joe would have had a clerical job than a labor job when working for his uncle so I changed him from pushing a barrel to pushing a pencil. While at it I tweaked quite a few other aspects of the illustration too. Compare them and try to spot what's different. Another comp sketch example for the Notable Missourian (Truman State University Press) book on Joseph Kinney. 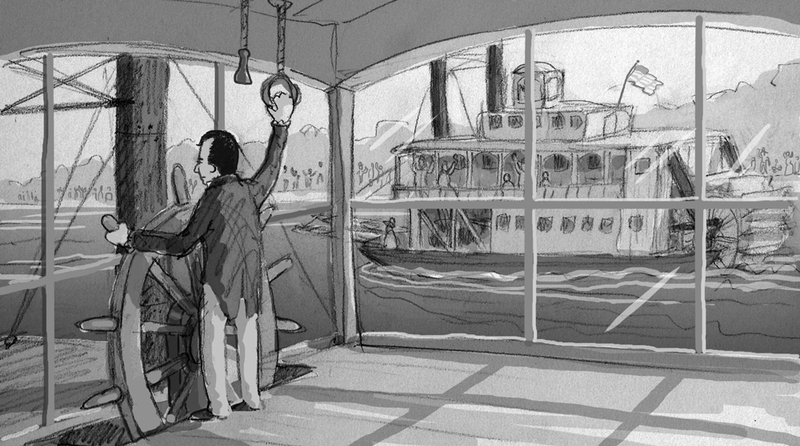 This one is a wheelhouse view of Joseph Kinney in a steamboat race.